I purchased and installed a Nest Cam wifi security camera yesterday and so far I'm finding it to be exactly as advertised: easy to install and configure, and impressively useful. The device itself is small and elegantly designed. We already have Nest smart thermostats in our home, and the camera integrates seamlessly into the account that monitors and controls those devices. 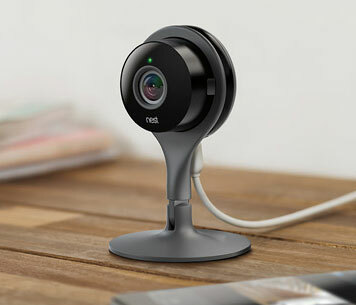 The camera connects to your home wifi network, and the free Nest app (works with iOS and Android devices) lets you monitor the live video feed from the camera wherever you are. Picture quality is impressive - up to full 1080p high def color with digital zoom capabilities. The camera has integrated infrared LEDs that provide night vision, and it works quite well. Even in a completely dark room the black-and-white video feed is clear and detailed. The camera also has a microphone and speakers so you can listen and talk to anyone near it. The microphone is quite sensitive; I can hear sounds from a TV in another room across the house. The camera can be configured to send an alert to your phone when it detects motion or sound (can be configured separately). You can create a day-by-day schedule of times when the camera will automatically turn on and off, and if you have a Nest thermostat, the camera can coordinate with that device to automatically turn on when you're away. When it detects enough motion (or sound) to activate, it then records a short video which is stored for review. I'm not sure how long those videos are kept, or how many are accessible. Nest has an option called "Nest Aware" that allows you to store up to 30 days of videos for an annual fee ranging from $100 to $300. At this point, I don't see a need for this option so I can't comment on how well it works. However, the Nest Aware account offers some additional features like the ability to "fine-tune" the motion and sound sensitivity of the camera. For example, according to the Nest website, the camera will activate when the doorbell rings, but not when your air conditioner cycles on, because it can identify the latter as background noise. You can also export video clips into a format that can be shared with others, which I suppose would be useful if your dog is apt to do amusing things in your absence. The camera comes with several mounting options. It can be placed on a shelf, permanently mounted to a wall, or attached to a refrigerator door or metal filing cabinet via a magnetic base. Note that the camera is for indoor use only, and must be plugged into an AC wall outlet. You can connect up to ten cameras to a Nest location (with a limit to two locations for a given Nest account). The camera is $199, and is available at all the usual big box stores as well as online via the Nest website. We already have a camera as a part of our security system, but it's pretty dumb and clunky compared to the Nest Cam. Even the security system installer couldn't get the camera to connect to our wifi and so we've got a separate wireless router just for that camera. I'm seriously considering replacing it with a Nest Cam. This page contains a single entry by Eric published on August 20, 2015 6:26 PM. Dispatches from the Texas Hill Country: The Charred Edition was the previous entry in this blog. Hotter'N Hell 16.09 is the next entry in this blog.